She was raised on the scent of racing. Daughter of an automotive engineer and the youngest of five very competitive children, Maria Teresa de Filippis didn’t set out to change the face of racing—but change it she did. Born in Naples in 1926, de Filippis stumbled into racing almost by accident. Her focus until then had been competitive, yes, but had been channeled into things like horse riding and tennis. It was only at the age of 22 and only after a bet between her brothers that she wouldn’t be able to drive fast that finally goaded Maria behind the wheel. History, though, has forgotten to record her brothers’ reaction to her winning her first race at Salerno-Cava dei Tirreni in a Fiat 500. But I’m quite sure their youngest sister was quite pleased to have accidentally stumbled into her calling. Her first events were most local, more down-to-earth. De Filippis honed her skills in difficult hillclimbs in southern Italy where she found herself to be the only woman in the field. Something about that fact, combined with her innate talent, pushed her forward. In 1949, de Filippis purchased a Urania 750cc and started expanding her scope. Still focusing on her Italian homeland, de Filippis began to travel the country to score three class wins and three class seconds in what can be considered her first real season as a racing driver. Even in events where she was entering alongside up to one hundred more experienced drivers, she brought home a sixth place in the Stella Alpina and a ninth in class in the Coppa d’Oro delle Dolomiti. The Urania had worked well for de Filippis, so she kept up with it for the following season. She entered her first Mille Miglia (although she, along with many others, didn’t finish) and became involved in a romantic affair with Formula One driver Luigi Musso. According to the historical gossip, Musso had quite the complicated love life. He was a big fan of multiple women back in his day, including, y’know, an actual wife—but that competition off the track seemed to inspire de Filippis. Any time Musso was racing alongside her, Maria had some of her most incredible performances. De Filippis kept racing and seeing Musso for several years. When their relationship ended in 1953, it seemed to be on amicable terms. The two remained friends, with Musso selling her his old 2000cc Maserati A6GC. It was also a time that saw de Filippis entering non-championship Grands Prix around Italy. Here, she could compete against actual Grand Prix drivers who dipped into the regional divisions in hopes of scooping up extra cash, as well as some of the most competitive up-and-coming drivers who were looking to impress the big-name teams. Her best finish was a second place in the Napoli Grand Prix, with fifth and sixth places being about her average. 1955 was a season of highs and lows. Just racing in one category wasn’t going to cut it for Maria Teresa. She kept up her Grand Prix racing, winning a race in Sardinia and once again securing runner-up at Napoli—but she also returned to running in hillclimbs. It isn’t noted why, exactly, she decided to diversify her season. Maybe it was money, maybe boredom, maybe just a red-blooded desire to race everything she could get her hands on. Her increased season also saw her first big accidents. At Mugello, de Filippis crashed Musso’s Maserati—when the emergency services got to her, the car was precariously dangling over a cliff. It was a lengthy process removing her from the vehicle, given that it was a matter of not jarring her body too much while also, y’know, not pitching the car over the cliff. She was eager to get back behind the wheel, perhaps too much so. At a race in Sardinia, she crashed yet again, this time putting an end to her season. 1956 saw something of the same. Taking a keen interest in long-distance sportscar events, de Filippis took her first trip to the Americas for the Buenos Aires 1000km at the start of the year—only to crash once again, this time swerving to avoid another accident and striking a telephone pole. She headed home to nurse a broken shoulder and was back racing around Italy that summer. It paid off: she won at Caserta and took yet another second at Napoli. And, in 1957, she joined Scuderia Centro Sud, then a leading race team. She was promised an eventual entrance in a Formula One race with them, so she stuck out what proved to be a difficult season. 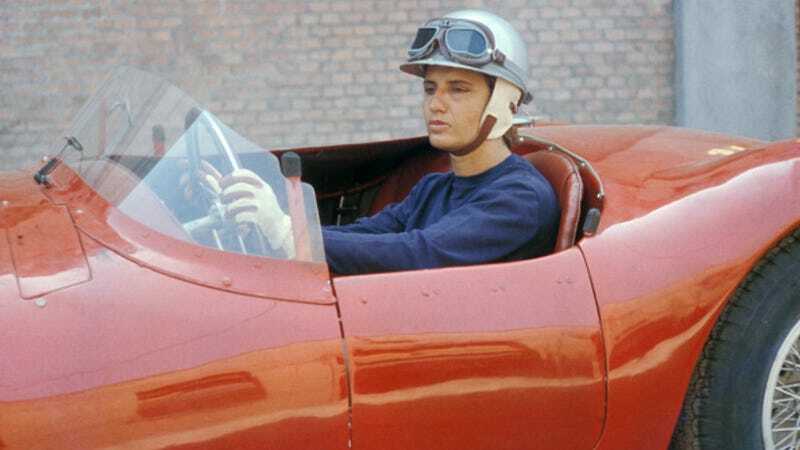 She wasn’t provided with much money, but she cobbled together what she could to purchase her own Maserati 250F Grand Prix Car—a privateer entry in Formula One several years before and one that took Juan Manuel Fangio to victory. From there, her goal was specifically Formula One. Maria Teresa entered several non-championship Grands Prix, and after an encouraging fifth place at Syracuse that earned her the title of highest-placed debutant, she found herself entered in her first World Championship Grand Prix. Her first attempt was Monaco in 1958, a difficult track for even the most experienced drivers. Only sixteen drivers were allowed to enter that race, which meant that sixteen others weren’t going to make the cut. De Filippis was among those who wouldn’t be seeking glory at Monte Carlo. She could, however, content herself knowing that she’d taken home a different title: the first woman to ever enter in a World Championship Grand Prix. Just one month later, she lined up near the back of the starting grid for the Belgian Grand Prix at Spa. Starting nineteenth, she overtook big names like Jo Bonnier to secure a tenth place finish. Back then, that wasn’t a points-scoring position. But Maria Teresa could be content knowing she had become the first woman to actually compete in and finish a Formula One race—and also earned the reputation of driving her Maserati too fast, according to Fangio himself. She started a Grand Prix in Portugal but suffered a terminal engine failure a mere six laps into the race. She tried her hand at Monza and was forced to retire again, this time after 57 of 70 laps. She attempted the Monte Carlo Grand Prix in 1959 with Jean Behra’s team in a Formula 2 Porsche but suffered the same fate as her first attempt: she didn’t qualify. She made her way up to the United Kingdom for her first attempt at a race, but once again did not qualify. That August, Jean Behra was killed in a race that de Filippis had intended to enter but withdrew from at the last minute. The previous year, former lover Musso was killed in the French Grand Prix. Both of these events hit de Filippis hard. She was having several difficult seasons in a row only for two of her closest companions on the circuit to lose their lives. It was too much for her. De Filippis retired from racing almost immediately after Behra’s death and instead focused on family life and building a career where she knew she and her comrades wouldn’t lose their lives at every turn. She didn’t step foot on a track for years, but in 1969, de Filippis joined a club for former Grand Prix drivers and was finally ready to begin telling her story. Somehow, as the years passed and people began to realize that only a handful of women were even being granted the opportunity to attempt racing in F1, de Filippis’ profile began to rise. People started to realize that she’d done something pretty incredible in an era that we normally consider less friendly to women than, say, the 1970s or 1990s. After several years of enjoying invitations as guest of honor for events like Goodwood, de Filippis got behind the wheel of a car again in 2006 at the age of 80, where she received a warm reception. In 2016 at the age of 89, de Filippis passed away. Maria Teresa de Filippis was quite the anomaly, almost unrecognizably so at first. At a mere 100 lbs and short stature, she carved her own path into the exclusive world of Formula One. To this day, she remains one of two women to ever start a Formula One race—something folks didn’t even really begin to take notice of until a string of unsuccessful female entrants were unable to qualify. Despite that, de Filippis has shown that, even in an era of difficult-to-handle cars and rampant danger, a woman could be just as capable as anyone else when it came to racing.